The original fourth-order active low-pass and high-pass Linkwitz-Riley filters for my three-way speaker project were implemented with standard Sallen and Key op-amp circuits, with each leg preceded by an amplifying buffer whose gain could be adjusted to optimise the signal-to-noise ratio, with the outputs attenuated correspondingly. The gain of the low-pass legs was adjustable by means of a 10k dual potentiometer - the Bourns plastic film pot I used didn't have particularly good channel balance, resulting in a difference of 0.6dB in the middle of its range, but I suspect that this won't be audible in the sub-400Hz range. 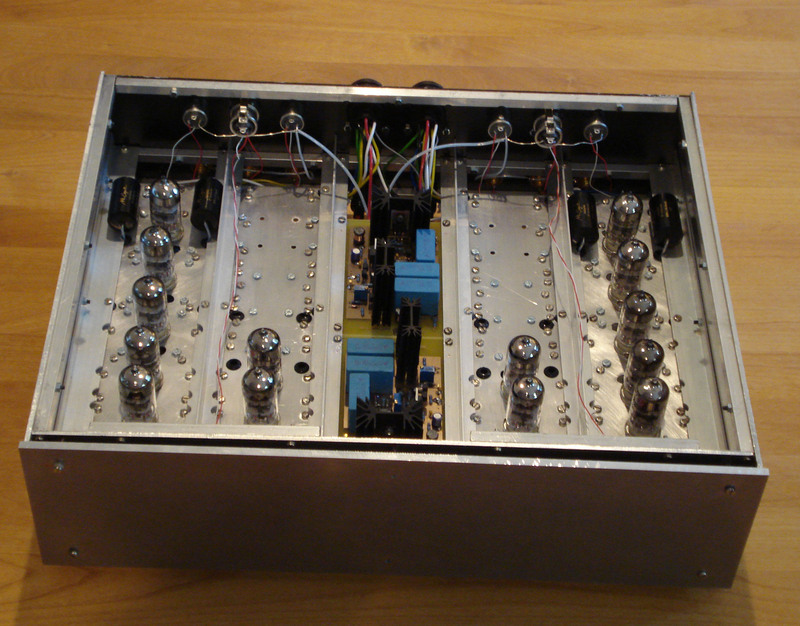 The crossovers were hard-wired on matrix board using metal film resistors and 1% polystyrene capacitors, with two pairs of LM317/337 regulators for each channel; power supplies were fully dual-mono, partly to minimise crosstalk, but mostly to maintain the integrity of the system earthing. 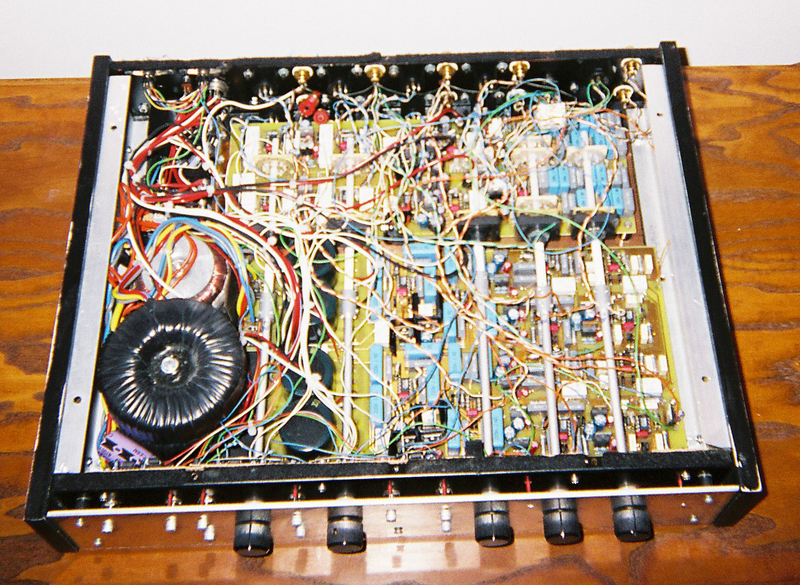 The single op-amps are OP-27, while the duals are RC4227 (PMI or AD dual OP-27). The photo (left) is of the first incarnation of the active crossover, which was very much a prototype, but stayed in my system for a couple of years! I measured the responses of these filter circuits (see right). The solid curves are the target responses, with the dotted and dot-dash lines showing the measured responses. The accuracy is generally better than 0.2dB across the range for both legs, which is satisfying, and the channel balance (disregarding the total gain) is even better, which is probably more important than the absolute accuracy. The crossover board also includes a circuit to compensate for the baffle step , with adjustable low-frequency boost and centre frequency. The first version of the active crossover was pretty much a feasibility study, to let me get my speakers running. As it turned out, I was very pleased with the results, but - as is obvious in the photo above - it certainly wasn't built with aesthetics at the top of the priority list, and it is also not as flexible as I'd like. In particular, I wanted to bring it up to date with my system rebuild, which started at the preamplifier. This has hugely improved enclosures and adds balanced inputs and outputs, and an upgradeable power supply system. Adjustable baffle step frequency to adjust for different box sizes. Adjustable baffle step size to allow experimentation with room position. Switchable filters and output for a subwoofer, probably crossed over at 70-80Hz. Mono facility for a single subwoofer, summing both channels (in case I can only afford to build my subs one at a time!). Switchable active filters for the bass-mid and mid-treble crossovers, to give a choice between active and passive crossover for these transitions. Switchable balanced and unbalanced inputs, and all outputs available as balanced or unbalanced. 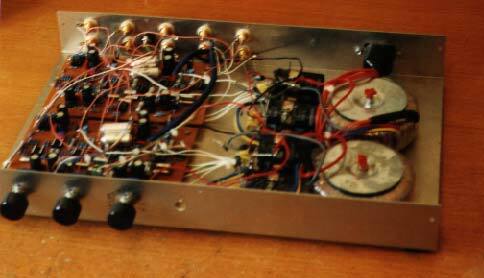 Switchable polarity inversion for all outputs except the midrange (the preamp already has a "master" polarity switch). This is simple to add, once the option of balanced outputs is included. Consistent gain for each section, regardless of filter settings selected (my low-pass sections are not unity gain in their passband, and the gain will need to be adjusted automatically). The gain indications on the front panel knobs ought to give an accurate representation of the passband gain at the corresponding outputs. The new crossover will also use switched attenuators for all of the functions, allowing much better channel matching and precise selection of parameters. The crossovers took a couple of months to build, but a puzzling radio-frequency instability took a while to sort out, and then I then managed to blow up the power supply of one of my Stochino amps. I then moved house, which set back the system rebuild by several months, during which time I built a set of shelves to hold my system. At long last, though, the Neptune speakers are in place in the new house and sounding very sweet. I fixed the RF problem by putting 100pF polystyrene capacitors between the inverting input and output of all the op-amps (including the balanced input stages). I was surprised that this was necessary, as the OPA2604 I used throughout is generally reckoned to be pretty stable. However, without them there was a faint whistle sounding like a badly-tuned AM radio. I also took the opportunity to raise the bass-mid crossover frequency from 400Hz to 600Hz to reduce the power suppled to the midrange drivers which struggle even with a 1V RMS signal at 350Hz. I'm now in the process of fine-tuning the crossover settings. I finally replaced the complex op-amp based crossover circuit with an equally complex (but perhaps more purist) differential active crossover (see left) with valve and MOSFET buffers. This took over a year to build and debug, but the labour and frustration were worth it in the end - my system is now sounding excellent and rather more musical and listenable than with the solid-state crossover. This was, unfortunately, not to last - the new differential circuit after a while developed a fault in the low-pass section which caused a loud "thump" to occur after half an hour of listening. In the end I decided to go back to a totally passive crossover for my speaker system, partly for reasons of heat production (and power consumption), partly on the grounds of reliability, and partly to simplify my system.